Why is change so difficult and why do so many people fail at making a change? We know that no only is change hard personally but also in organizations. Many times change is a more than a mere hurdle it is a roadblock. Neuroscience is helping us to understand this phenomenon. Neuroscience confirms that, in fact, change is difficult, even painful, and it takes effort. This is not just hyperbole it is fact. There are a number of reasons for this. 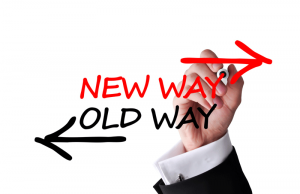 One reason that change is hard is that long-term memory shapes the way that we approach new ideas or new ways of doing things; these memories can either enhance or constrain the change process. For change to occur the previous context has to be removed and a new one introduced. Sounds simple, but there are various parts of the brain that have an important function in removing past context and opening the way for new ones. Central to this is the prefrontal cortex (PFC), which in conjunction with other parts of the brain, play an important role in mitigating change. The prefrontal cortex is the part of the brain that is responsible for higher order thinking. This part of the brain consumes a lot of energy. Parts of the PFC responsible for change; include short and long term memory as well as the medial frontal cortex (vmPFC) which assesses the pros and cons of the change. Working memory (where the brain compares what is known to what is being introduced) also resides in the PFC and is then transferred to the basal ganglia (part of the limbic system) where habits and routines are stored. The limbic system takes less energy and this is one reason that we tend to do things out of habit instead of taxing the PFC, which can become overwhelmed when it is forced to focus on a new behavior, and thus defaults to other parts of the brain. Further, the brain is wired to detect differences between what is expected and what actually occurs. When something unexpected occurs, parts of the brain associated with the amygdala’s fear circuitry are activated and a fear response is triggered. That fear response results in energy being taken away from the PFC. This may sound technical but basically when there is a difference in what the brain expects to happen based on past experience and what actually happens a fear response is signaled that interferes with the more rational thinking area of the brain, the PFC. Once a fear response is activated, the ability to change is stopped in its tracks. By understanding the neuroscience behind the how the brain processes change, coaches and leaders can work to overcome these obstacles in order to effect change. One way to do this is through regulating emotion, and the fear response that is triggered when change is on the horizon. Assessing one’s own thoughts, feelings, and behaviors in regard to the change can help in doing this. A coach can help a person walk through the implications of change by asking questions in regard to the change, how the individual feels about the change, for example. Many times resistance to change is due to lack of emotional information. Also, important to change is allowing a person to reflect on the change and fostering self-control and insights. Insights have been shown to have a reward like effect on the prefrontal cortex. Reactivating the PFC will help in facilitating change. One way to accomplish this is by inspiring creative thinking, which activates the PFC. Another way to accomplish this is to focus the person’s attention to the desired results by asking questions, and testing assumptions that focus on the new behaviors in order to inspire insights. Once a person has come to accept change, the work is not over. As mentioned above, neuroscience informs us that habits and routines are stored in the basal ganglia which informs a person’s behavior, and therefore the change has to be reinforced to become a habit. This is ongoing process that can be further reinforced through the use of a coach who can help with feedback, tapping into positive emotions, and strengthening the commitment to the new way of thinking or doing.